I often get asked what sewing machine I use to make samples. And it's my trusty domestic machine. Don't get me wrong I would an industrial machine and yes they do finish the garment in a more professional way however having moved around for the past years from country to country it's been my 'Brother' that has followed me. The Brother XL5500 is what I do most of my samples on (before Brother I had Janome). 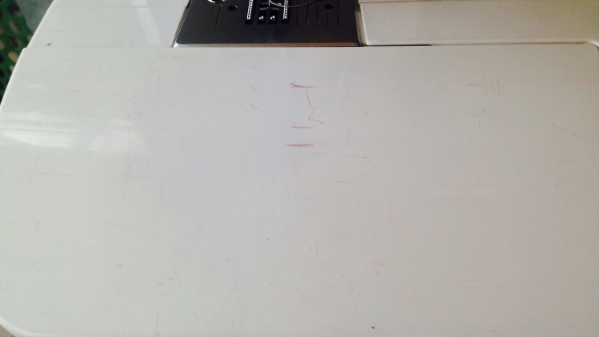 I'm a writer on my machine - I have penned marks where I need to pull the elastic too for the right tension. I write on where I need the dials to be for certain projects. What I look for is being able to move the needle left or right so I can work out seam allowance quickly. And the stitches I use most are number 2: zig zag to attach lace for elastic, number 3: straight stitch to construct the garment and number 6: 3-step to attach elastic.